Looking For a VIN Decoding Solution to Integrate With Your Products? Learn about the history of Vehicle Identification Numbers and how VIN decoding works across various markets and vehicle classes. 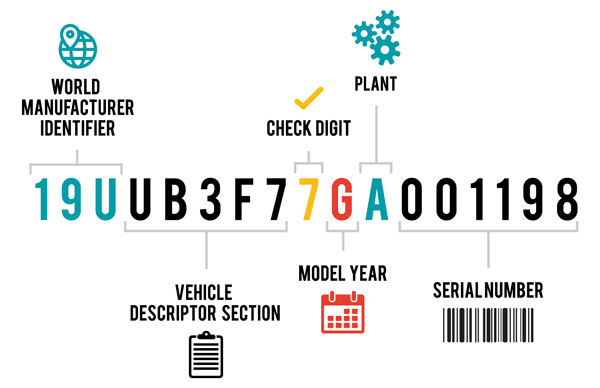 The vehicle identification number (VIN) is a unique string of numeric and alphanumeric characters assigned to a vehicle that contains information to describe and identify the vehicle. The VIN number can be located on the dashboard, visible through the windshield on the driver's side, as well as on the driver side door jam. In 1981, the 17-digit VIN was standardized by the NHTSA for vehicle destined for use in the U.S.
For more details on the history of the VIN, view our article "What is a VIN?" What is encoded in a VIN Number? VIN numbers encode much of the core vehicle information, including make, engine, body and drive type, passenger restraint system, when and where they were manufactured, and the serial number. However, some of the information can vary greatly between OEMs, especially in the vehicle descriptor positions (4-8). See detailed descriptions on what's encoded in the VIN in this blog article. Many VIN decoder solutions provide more vehicle information than what is encoded in the VIN by tying additional vehicle details to the VDS positions. Learn more in the section "Vehicle details you should expect from a commercial VIN decoder." The market that a vehicle exists in has a significant impact on what information is available to decode. Though many markets share some similar VIN standards, such as the NHTSA or ISO standards, each regulatory body has at least some aspects of their requirements that make them unique to that market. For that very reason, many VIN decoding solutions specialize in certain vehicle markets. View our blog article "The Market's effect on a VIN" to learn more. What's a VIN Squish or VIN Pattern? These two terms are actually interchangeable, both describing the portion of the VIN where core information is encoded. The VIN pattern/squish is made up of positions 1-8, 10, and 11. These are just two of the many terms centered around VINs and vehicle data. View this blog article to become a master on VIN terminology. There is often some confusion about what information can actually be obtained from a VIN number. For example, year, make and model are always encoded, however, trim cannot consistently be identified from VIN alone. There's a great deal of variability in what's encoded within the vehicle descriptor section (positions 4-8). All commercially available VIN decoders will extract the information encoded in the VIN Pattern or VIN Squish (What's a VIN Squish?). However, the good ones will also pass along additional information that they know about the vehicle and its configuration. Some of these inputs may include the OEM Model number, package code, installed equipment and option codes. This is sometimes referred to as VIN explosion. For more info, view our blog article "10 Vehicle Details You Should Expect from a VIN Decoder"
Decoding a VIN can return a large amount of useful information. However, there are still many vehicle details that can't be determined from a basic decode of the VIN pattern alone. There are some vehicle details that are sometimes encoded in the VIN and others that are never encoded. Fortunately, a commercial VIN decoder such as DataOne's is able to identify many of these details not encoded in the VIN by pulling in additional data sources. View our blog article "10 Vehicle Details Not Decoded By the VIN Pattern" for details on each of the above bullet points and how you might obtain these important details by VIN decoding. Passenger and light-duty are not the only vehicle markets that require a 17-digit VIN for on-road use. Some others include medium- and heavy-duty trucks, motorcycles, trailers, and recreational vehicles (RVs). Though being able to decode these vehicles is valuable, there are some associated challenges since the NHTSA VIN requirements are not quite as strict. Medium-duty - These vehicles are typically customized a great deal after manufacturing and the VIN won't identified modifications made to the vehicle. Heavy-duty - Decoding HD vehicles is a similar challenge to the medium market. There is often a lot of customizing with these large vehicles. Trailers - All towable trailers and equipment are required to be assigned a 17 Digit VIN. Learn more about trailer VIN decoding here. RVs - RVs can have multiple VINs, one assigned from the chassis manufacturer and the second assigned from the RV manufacturer. Additionally, RV VINs don't capture optional equipment and customization. For further details, check out our article "VIN Decoding Outside the Light-Duty and Passenger Vehicle Segment." Recreational "off-road" vehicles (ATVs, UTVs, side-by-sides, dirt bikes, snowmobiles) are another very popular vehicle market in the US with millions of units sold every year. There is a need for VIN decoding and vehicle identification to support initial sales and marketing efforts, resale, registration, insurance, and taxation. However, VIN standards for off-road vehicles are not nearly as rigid as for vehicles intended for on-road use. The good news is that many of the major manufacturers will still assign a VIN compatible with the ISO VIN Standard. If you are looking to decode off-road vehicle(s) in the North American market, here are some more details in this blog article. Have questions about our vehicle data and VIN decoding solutions and how they can work for your business? We'd be happy to discuss your product(s) requirements.